Aikatsu! – 165 | Mezashite! Like, comment, and subscribe if you eat strawberry shortcake correctly and save the best for last. Wow there’s a goldmine of stuff to say about this episode. First and most importantly, no new Aikatsu this week, December 31. It will return on January 7. There were literally four new dialects this week which were done with varying degrees of success: Kansai (which I guess isn’t new), Kyushu, Aomori, and Akita (which is host to our new friend Hanawa Yayoi). And speaking of her, her gimmick relates to a local demon called the Namahage, which you can see on her head and in the statues. There were three old OST pieces that I caught this episode, which I’ll relate after the break, as well as several KiraKiratter tweets that were prohibitively hard to typeset. Look for them after the break as well. Alright then, Happy Merry [Late] Christmas! Nono: It’s finally the Luminas Tour final stage! I hope that it snows for the occasion! Miyabi: Akari-chan and the girls did a great job. I was very happy when they came to see us in Kyoto. Let’s all continue to do the best Aikatsu we can! Wait a second, could that first one possibly be a certain gardener we all know and love…? Aoi: Ooh, I like that idea, Nono-chan and Risa-chan. I’ll be praying I’ll get to watch the final stage in the snow! Well, I simply don’t have words to thanking you, seriously. Your devotion and passion for this series is unmesurable, and you do’nt know how you make me feel happy for all hard work you put in this project. 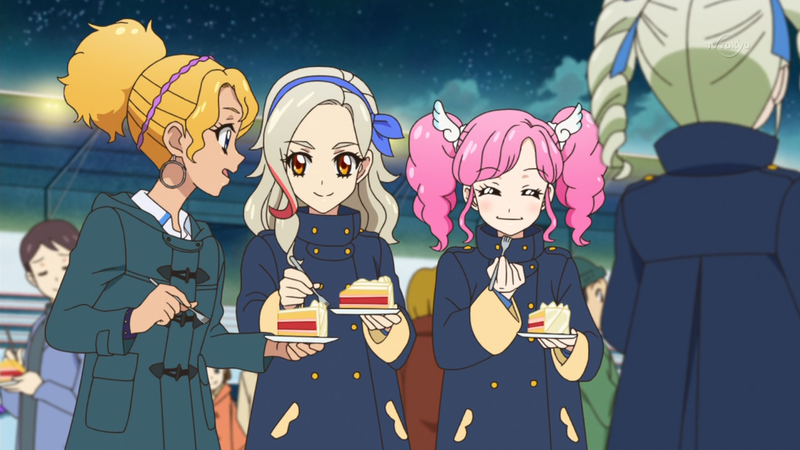 Aikatsu evokes the best in all of us, and this episode is the proof that are the little things that made us happy after all. Happy New Year and a great hug to all of you. LOVE YOU!! thank you so much! great translation job as always! happy new year! Thanks, appreciate all the work that goes into these.